N8 have published and authored several reports looking at key aspects of Higher Education policy relating to efficiency and equipment sharing. Following the publication of the Wakeham Review of efficiencies in research funding, the N8 established a project, funded by the Engineering and Physical Sciences Research Council, to examine the opportunities, barriers and current best practice in relation to sharing the use of equipment between research groups. The key findings and recommendations from these have been summarised in the report “N8: Sharing for Excellence and Growth” by Professor Luke Georghiou, Vice President for Research and Innovation at the University of Manchester. N8 published Making the Best Better on behalf of the Department for Business, Innovation and Skills highlighting how universities across the UK are working across a range of areas to improve cost efficiencies and the effectiveness of teaching and research. Raising The Return – Benefits and Opportunities from Sharing Research Equipment was published by the N8 as part of the Efficiency, Effectiveness and Value for Money report commissioned by the Department for Business, Innovation and Skills. The report was authored by Luke Georghiou, Vice President, Research and Innovation, University of Manchester and Sarah Jackson, Director of Research, Partnerships and Innovation at the University of Liverpool and former Director of the N8 Research Partnership and focusses on progress made on equipment and asset sharing and further recommendations for promoting further efficiencies. 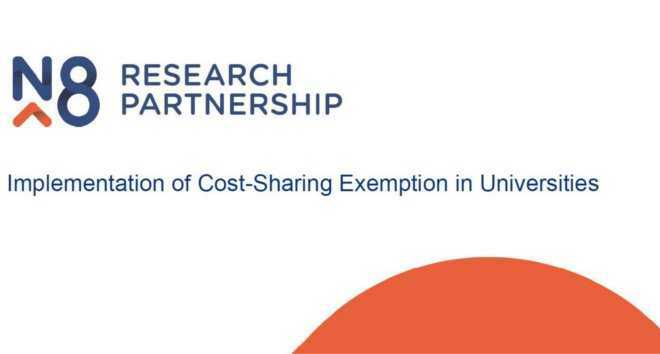 Following a two year project exploring VAT tax exemptions through a Cost Sharing Group (CSG) for universities which share equipment, N8 published this report, concluding that too many legal and financial hurdles exist. By utilising the N8 HPC as a model facility, N8 hoped to demonstrate the value and viability of the Cost-Sharing Exemption using an existing shared asset. However tax rulings rendered the proposed model impractical and suggested alternatives moved the VAT charge elsewhere in the supply chain.